Study each school’s audition requirements carefully. Decide on your repertoire about a year in advance and aim to finish learning the pieces 2 – 3 months before your first audition. Choose pieces that you can play well and that represent you in the best light. 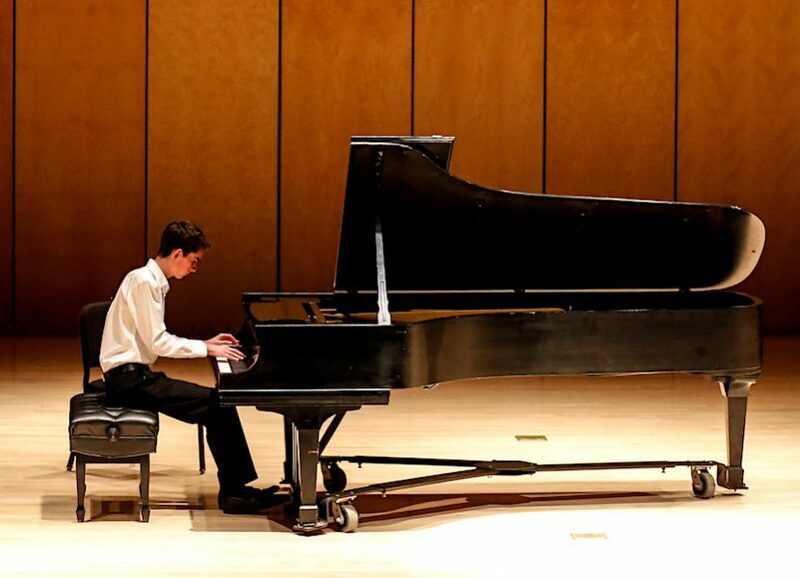 Usually, the audition committee expects to hear a variety of music: a slow piece; some Bach to see musicality and understanding of style; and a fast piece, like the first movement of a concerto, to show virtuosity. You can decide to play more of Bach if you feel really comfortable with it and love doing it, or you can play only a short movement if you feel this is not one of your strong areas. Faculty members usually communicate with their applicants, so take advantage of the opportunity to ask questions and express your interest in their music program. Schedule a trial lesson far in advance. Perform all of your audition pieces as many times as you can before your audition. At minimum, schedule a recital for friends and family, your congregation, or people in a retirement home. The amount of daily practice time dedicated to playing through complete portions of audition pieces should increase significantly the closer you get to your audition. Students – as well as professionals – get too used to being able to stop at any time during practice when they make the slightest mistake; this will not be helpful during an audition when you have to keep going even if something happens. A habit of going through complete sections or pieces has to be cultivated before auditions. Set yourself up for success on audition day. When you arrive on campus on audition day, find the check-in table and sign in. This is important because if a student doesn’t check in, the committee will be notified and the faculty will move on to the next person on the schedule. Arrive well in advance to allow enough time to find everything, including your audition room, and to warm up. Sometimes students don’t realize they will not be able to perform all of their audition pieces in their entirety, simply because the committee has limited time scheduled for each candidate. Be prepared for us to interrupt you in mid-performance by practicing stopping in the middle of a piece, concentrating, and starting another piece. Not taking enough time to concentrate before playing is one of the most common mistakes we see. Taking the time to imagine the mood and character of the next piece is crucial. Students who don’t do this usually make a mistake very soon after beginning. While students usually start auditions with pieces of their choice, sometimes committees will select the next piece (or even the very first one) from a candidate’s repertoire. You might not play in the order you’re used to playing when preparing for your audition, so practice performing your pieces in various orders. Don’t worry if you’re not perfect. At college auditions we’re looking for students who are good players with potential to grow as professionals. We overlook deficiencies or mistakes if we see talent, determination to succeed and a willingness to work hard. While you should try to perform your very best, remember that nobody is perfect. Dr. Misha Galaganov is chair of strings and professor of viola at Texas Christian University in Fort Worth, TX. His former viola and violin students can be heard as principals in orchestras, university teachers, soloists and chamber music performers. Thank you for the article! I’m doing my audition (for Univ. of Toronto, Canada) and it’s been sometime since I’ve been at music school – I’ll be sure to be ready to play my selected pieces in any order then! Thank you very much for this article. I am 65 years old and have had enough years as a pianist to vouch for this very sound practical advice!